First, to all in the USA, Happy Fourth of July!! In honor of the holiday, I did a theme manicure. Which is funny because I’m not huge on nail art. I don’t even really do things like french manicures. If you’re interested, you can skip to the bottom of this post. 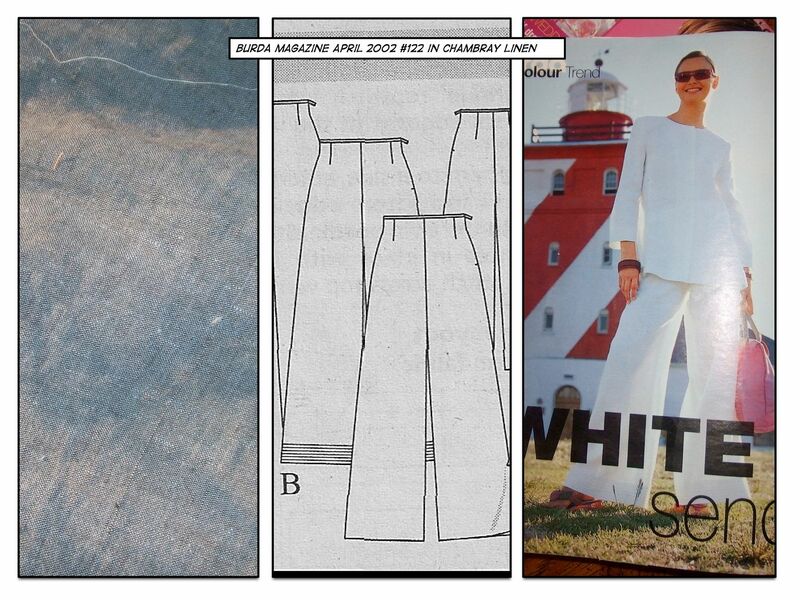 I finally got started on my muslin of Burda 4-2002-122. I started with 42 and made a ‘large buttocks’ adjustment and the fit was great. I could possibly next time start with a 40 and adjust from there. These are possibly too baggy, but that’s the style. I thought I would show the adjustment here (That knee line might not actually *be* my knee). So, this on alteration covered my problem areas. You can see that I also added less than a 1/4 of an inch to the outer thigh. Not needed at all though since this style is so baggy. Here’s hoping it all works out in the linen too! I’m off to the fireworks tonight at the Inner Harbor. But, I should have these sewn up tomorrow! I copied this look from here. The stamps are available here. Holiday Fun! Love your mani it’s beautiful!! Very interesting alterations. Are you using a specific book or have you worked these out yourself over time? Great nails! Wow – those pants are so very Carol Brady!!!! I have blue nails in honor of the holiday (red white and blue – hair, t-shirt and nails). Have a great rest of the 4th! I will be waiting with breath that is bated for more info on the large buttocks alteration (aka-the junk in the trunk fix) as I have the same problem/issue. I’m loving those pants . . . can’t wait to see the finished product! Might be a little late, but Happy Fourth of July, Cidell. I am loving the pattern picture for the pants. Looking forward to your finished piece. Love the style of those pants — should look great in linen. Hope you had fun watching the fireworks! Your nails are sooooo cute! Glad you are moving right along with the wardrobe. I’m bringing the patterns to work with me tomorrow so look for them on Wednesday or Thursday. 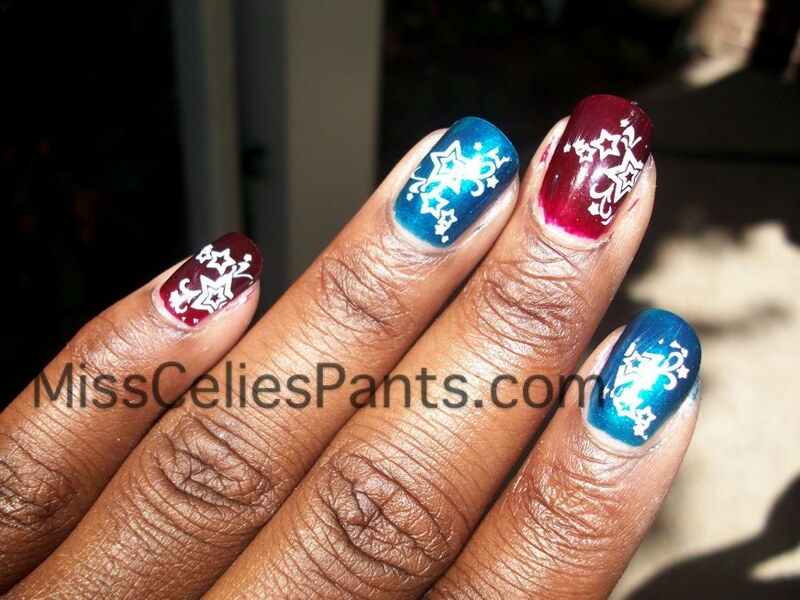 Cidell, I love the designs and colors on your nails. I cannot wait to see the pants. Love the mani! Can’t wait to see the pants. I know you posted this a few days ago but I’m hoping you’ll see my comment/question. 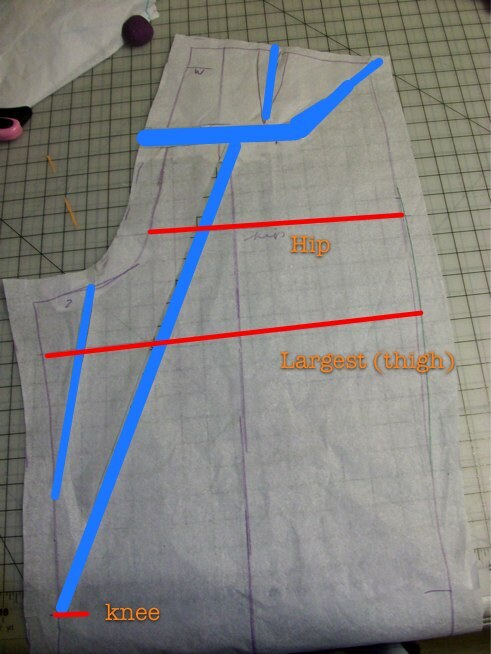 I have the same fitting book and I also need to make the ‘chub rub’ alteration on the thighs but can’t figure out exactly where to put the alteration line to slice and spread. How do you know where exactly to place it? Does it matter? This may not be helpful, but I kind of guessed. For the second pair of pants I worked on, I also added it to the front pant leg. I did it to the back leg first, but still had some drag lines. Please let her know that I succumbed to the new All the Jazz Collection, plus one with very little resistance!